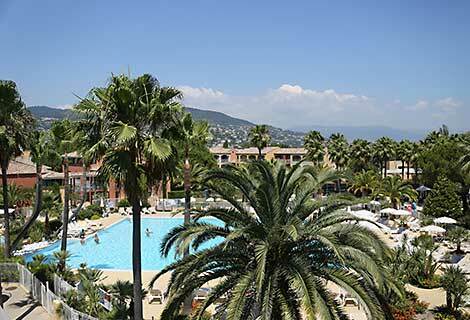 With 180 apartments, the ‘Rives de Cannes Mandelieu’ Premium Residence is ideally situated on the Robinson peninsula. With views over the ‘Old Course’ golf course, this residential hotel offers an excellent working environment. The Convention Centre was totally refurbished in early 2014 and is located between the 400 m² swimming-pool and the river, with views of the palm trees bordering our private pontoon. 1 restaurant for seminars situated in the Convention Centre and nearly 500 m² of meeting rooms. 1 SPA with Hammam and treatment room to relax in your spare time. You will also have access to our sports facilities, such as our boules court, 400 m² swimming-pool (from April to November – heated), multisport grounds and last but not least, the Mediterranean sea just 800 m away. On the 1st floor: six modular rooms 50 m² each (Capacity: up to 290 people with back-up screens). Added extra: a business corner is available. Special area for organisers. Only you have access to this relaxation corner with a sofa, hot and cold drinks and snacks, and a work corner with two computer stations and a printer. All the accommodation on the site was refurbished in 2013 to give you the best in comfort. In the hotel seminar package, your bed is made every day, the bathroom linen changed every day and there is a dressing-gown available too.